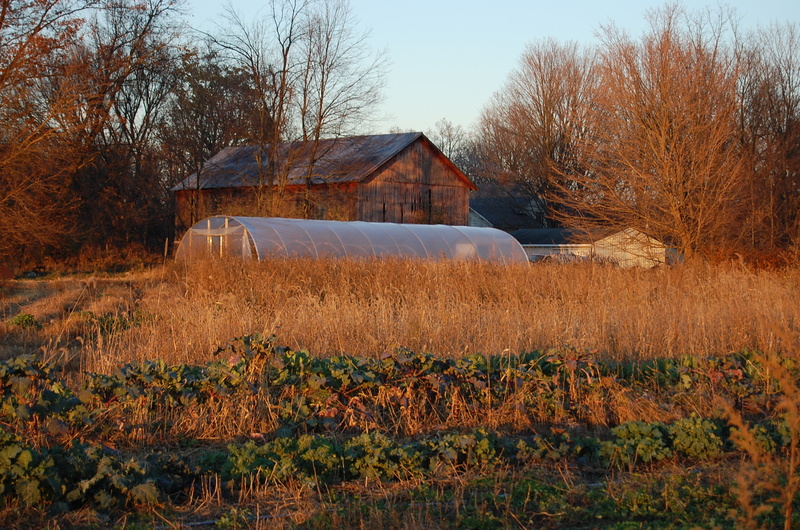 About 90% of Green Gardens’ sales are direct-to-consumer, either through their CSA or at the local markets, with the other 10% wholesale to restaurants, the People’s Food Co-op, and through Sprout Urban Farm’s small food hub in Battle Creek.I ask whether it would be a benefit to Green Gardens to have a larger wholesale outlet close by, one that could take their excess produce, and Trent says “yes, definitely.” Tomatoes were especially abundant this year, for example, and it would have been great to have a place to sell them in bulk, even at the lower prices he gets for wholesale. 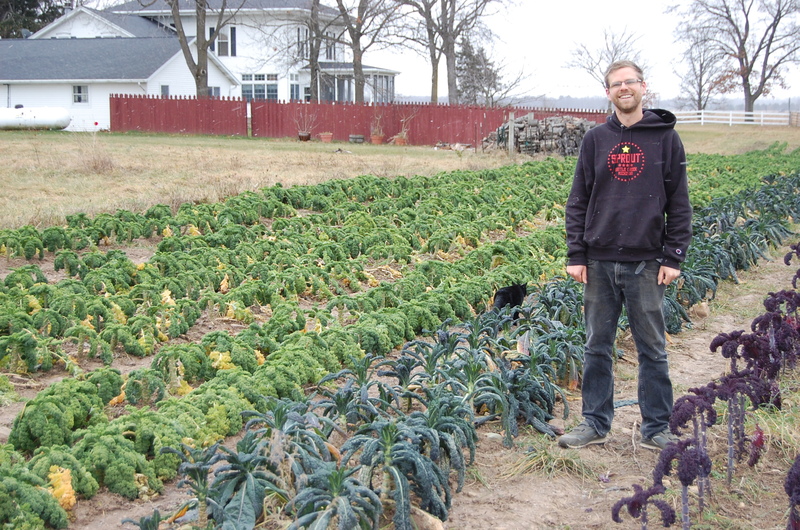 For a farm of his size, though, the margins are so much better with the direct-to-consumer options that they will remain his focus, and the CSA is the foundation of those, since it provides for consistent predictability in terms of both harvesting needs and income. They’re hoping to grow this portion of their business as they make infrastructure improvements, but still, Trent notes, thinking both about their own operation and those of other vendors they see at the markets, “farmers have to be smarter about how they market and sell their product if they’re going to be competitive. I just don’t think you can keep throwing stuff out on a farmers’ market table and hoping it’ll sell.” They need to “find ways to reach out to people and get them excited about food, get them to come out.” One of the efforts in this direction that Trent and Ruthie are most excited about is an on-farm market they opened this year that anyone can come to, not just CSA members. “We’re doing all the veggies,” Trent says, and “I buy local fruit from other people,” including apples from Molter Family Orchards and The Country Mill. Chicken and (soon) pork come from Green Gardens alum Clay Smith at EarthSmith Food and Forest Products, and a variety of other things ranging from quiche to maple syrup come from other local producers. The goal, explains Trent, is “to be a one-stop convenience shop for people,” so they can get most of what they eat on a regular basis from local producers with just one stop. Snow flurries swirl along I-94 as I drive out to talk to Trent Thompson of Green Gardens Community Farm, east of Battle Creek, a week before Christmas. It’s been an unusually warm fall, allowing field crops to continue to be harvested far past when they can be most years. Yesterday was a day to get as much picked as possible, so today is the semi-official end of the season, or as close to the end of the season as Trent gets. 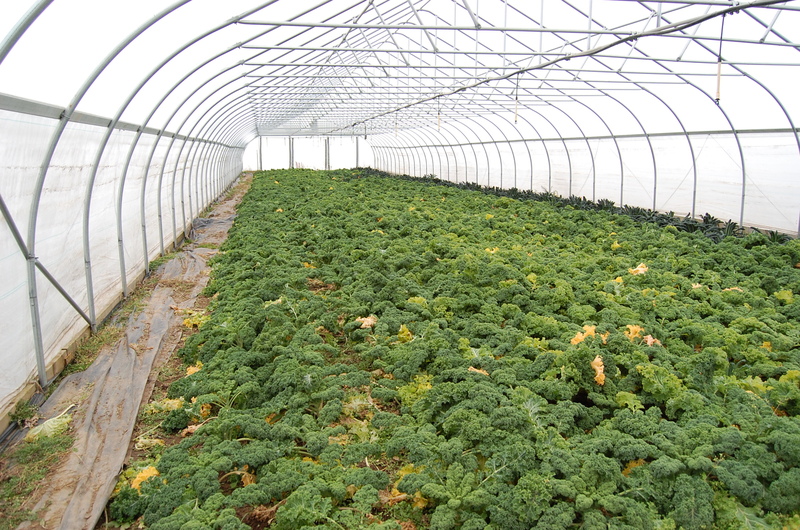 Several of his hoop houses are full of greens which, along with carrots and other vegetables in storage, will send him every week to the indoor winter market in Kalamazoo. 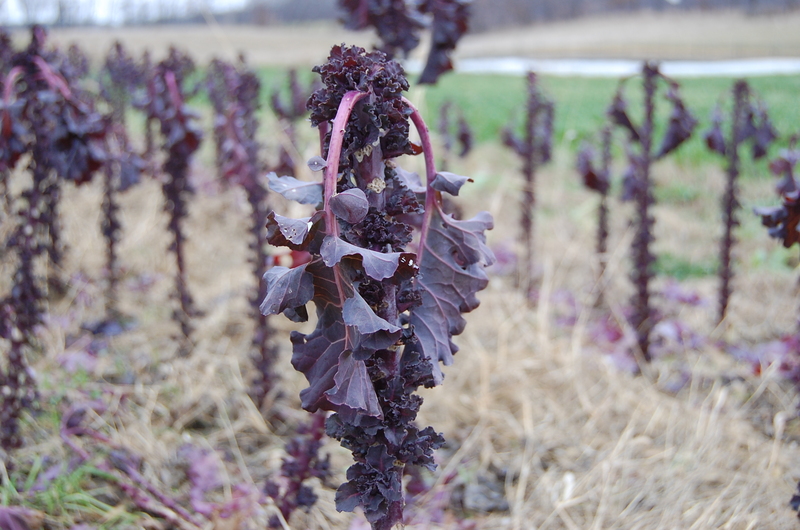 This makes eating a lot tastier and healthier for those of us who try to source as much as we can from local growers, but it also means a lot less down time for farmers after the relentless work the usual spring-fall crops demand. Trent has had only two half-days off since May before today, something a January trip to Florida will only do a little to make up for. But Trent isn’t complaining. Though I’d met Trent at a dinner Donna McClurkan organized several years ago, and though hardly a week has gone by when I haven’t bought something from his stand at the Bank St. Market, I’ve never been to his farm, either the original one he started on rented land in 2008 or this one, which is on twenty acres that he and his wife Ruthie purchased in 2012. I pull up and park in front of a long low barn sitting perpendicular to a row of six big hoop houses and next to a stately old white farmhouse with a wraparound porch, columns, and shade trees in front. Trent and Ruthie, along with toddler Jorah, will soon move into the main house out of an apartment built off the back that they’ve been renting, just one of many steps forward that they’re taking as their farm grows. Trent calls to me before I can ring the wrong doorbell, and I walk over to meet him where he’s come out of the barn. He greets me with a strong handshake and then we head inside to talk for a bit with Ruthie before he and his feline helper, May, give me a tour of the farm.